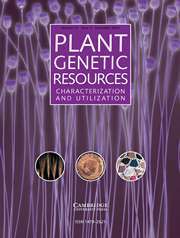 Plant Genetic Resources is an international journal that brings together the many diverse topics concerned with plant genetic resources. Each issue gives you access to peer-reviewed research papers on genetic variation in plants, both crop and non-crop, as well as on the technical, socio-economic, legal and geo-political aspects of PGR. Many papers feature research directed to endangered non-crop and medicinal plants. The journal is of interest to researchers and scientists involved in the plant genetic resources community, including: breeders, all those with an interest in germplasm, policy makers, consultants and research students.